What if Jesus was just an ordinary boy seeking enlightenment? Read the award-winning novel about Jesus's travels in India and Nepal, based on ancient scrolls discovered in a Tibetan Monastery. 8 AD, at the Temple of Jerusalem, charismatic young Yeshua thrills his audience when God seems to communicate through him. While his listeners gush, not everyone is impressed. The priests scoff and say that no carpenter, however wise, can enter their holy ranks. Humiliated and robbed of his only dream, Yeshua resigns to a drab life as a laborer and even agrees to marry the wealthy maiden his father has chosen for him. One day, Yeshua meets a Buddhist pilgrim who invites Yeshua along to the magical country Sindh, where anyone can become a monk. An irresistible portal of hope opens. He joins a camel caravan and sets off on a thousand-mile journey across the Silk Road into the unknown. Along the way, he studies the teachings of the Buddha and Krishna, loses his virginity to a beautiful young widow in a secluded convent, and falls in love with a cave-dweller high up in the Himalayas. 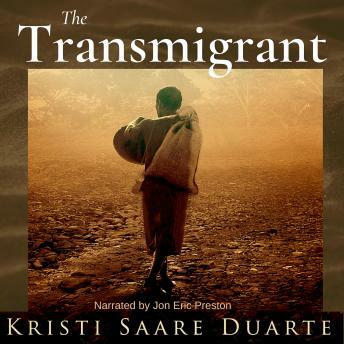 Riveting, enlightening, and deeply moving, The Transmigrant is a vivid story about Jesus's lost years that will fascinate you and stay with you forever. If you enjoy spiritual, thought-provoking fiction like The Celestine Prophecy or The Alchemist, you will relish this intriguing page-turner.